Working together in the Tame Valley Wetlands – celebrating our achievements! 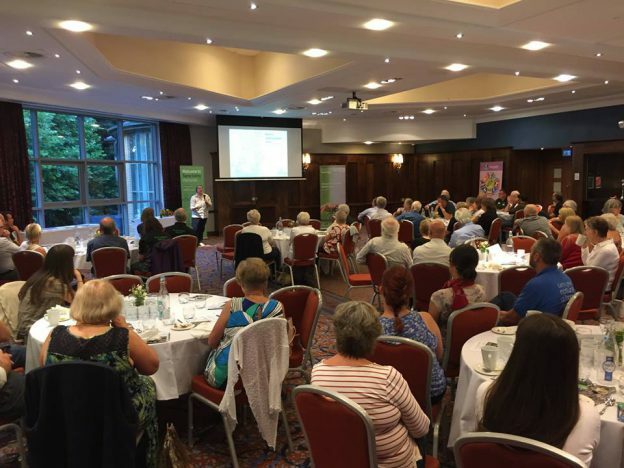 Nearly one hundred volunteers and representatives from local groups and organisations on the Tame Valley Wetlands Landscape Partnership came together to celebrate the Tame Valley Wetlands Landscape Partnership Scheme on Tuesday 17th July 2018. The evening event took place at Drayton Manor Park Hotel near Tamworth and celebrated the successes of working together in partnership for the benefit of the natural environment, heritage and people in the Tame Valley Wetlands – a unique, watery landscape between Birmingham and Tamworth. The Partnership also presented its future vision and plans for the area. Delivery staff talked about their top highlights and there were displays from partner organisations. A film summarising the scheme’s achievements was also premiered, which will be launched online in August. Volunteers and staff were thanked for their hard work and support and two individuals received a special award in recognition of their long-standing dedication and commitment to improving the environment of the Tame Valley Wetlands. Andrew Crawford is the Biodiversity Technical Specialist at the Environment Agency and has worked tirelessly to improve the River Tame and its tributaries for over 30 years. Andrew has led and advised on many river restoration projects and has seen the transformation of the river over the decades – from one that was so polluted it sustained no life at all, to a thriving watercourse home to wildlife such as grayling and otter. Maurice Arnold is a local naturalist with extensive knowledge of natural and local history. Maurice was a founder member of Staffordshire Wildlife Trust and has been an active local wildlife recorder and surveyor for over 60 years, in particular carrying out fritillary counts on Broad Meadow Local Nature Reserve in Tamworth since the 1950s. This has provided vital data to protect these important sites and inform current and future management. “We are delighted to be able to present a special award to Andrew Crawford and Maurice Arnold for their outstanding service to the Tame Valley Wetlands over so many years. We would also like to thank everyone who has volunteered and worked on the scheme over the last four years – none of this would have been possible without their amazing help and support, and the vital funding received from the Heritage Lottery Fund, our partners and other funders. The Partnership was established back in 2005 and we plan to build on the successes of the last few years with an ambitious 2030 vision, focussed on continuing to enhance the environment and connecting people with their landscape. We also plan to develop the area as a green tourist destination and work with planners and developers to protect and enhance the environment where possible for both people and wildlife. The evening was rounded off by a positive speech from Alan Taylor, National Heritage Lottery Fund Committee Member for the West Midlands. The National Heritage Lottery Fund has been the primary funder of the Tame Valley Wetlands Landscape Partnership Scheme, investing £1.8 million since 2013. This will result in investment in the Tame Valley Wetlands’ landscape of £2.5 million by the end of 2018. Amongst the successes of the past few years, the Tame Valley Wetlands Landscape Partnership and Warwickshire Wildlife Trust were named as a finalist for the UK River Prize 2018 and the winner of the ‘Multiple Benefit Partnership’ category. created a long distance footpath ‘The Tame Way’ and various circular walks. The Tame Valley Wetlands Landscape Partnership Scheme is supported by the National Lottery through the National Heritage Lottery Fund. Its vision is to ‘create a wetland landscape, rich in wildlife and accessible to all’. The Tame Valley Wetlands Landscape Partnership is led by Warwickshire Wildlife Trust in partnership with a wide variety of organisations including charities, local groups, statutory bodies and councils. The Tame Valley Wetlands Landscape Partnership (TVWLP) has a vision of creating a wetland landscape, rich in wildlife and accessible to all. There are 23 organisations on the Partnership and the Board consists of Warwickshire Wildlife Trust (Lead Partner), the Canal & River Trust, the Environment Agency, Natural England, North Warwickshire Borough Council, the RSPB, Solihull Metropolitan Borough Council, Staffordshire Wildlife Trust, Tamworth Borough Council and Warwickshire County Council. The Tame Valley Wetlands (Landscape Partnership) Scheme will be delivered by the TVWLP between 2014 and 2018. The Partnership will receive £1.7 million funding from the National Lottery through the National Heritage Lottery Fund (plus £100K development funding in 2013), enabling a £2.5 million scheme to be delivered, which aims to restore built and natural heritage and reconnect local people with their landscape. The scheme covers a 104 km² area of the Tame Valley Wetlands between Birmingham and Tamworth, in North Warwickshire and south-east Staffordshire. Work will focus on conserving and enhancing approximately 50 hectares of river and wetland habitat and restoring two Grade II listed structures on the canal network. The scheme includes the development of the Tame Way – linking, enhancing and promoting a network of footpaths, bridleways and cycle routes between Birmingham and Tamworth. Plans are also in place for a new interpretation centre at Kingsbury Water Park and an interactive website and phone app, providing easily accessible information and resources to help people explore and discover the Tame Valley Wetlands. The initiative will also provide volunteering and training opportunities for local people and support groups working to look after their local area. A series of events and activities will also be delivered, with the aim of engaging with hundreds of school children, young people and members of the public. Informal training will be provided through taster days, with the chance for people to learn new skills and improve their CVs through more formal, accredited training programmes. Wetlands provide a vital role in reducing flooding and improving water quality, whilst their biodiversity-rich habitats also provide an important home for wildlife and a place for sensitive recreation and relaxation. The Tame Valley Wetlands are a ‘blue lung’ in an area of the country otherwise dominated by transport routes and development. For more information, visit www.tamevalleywetlands.co.uk. Warwickshire Wildlife Trust (WWT) is the lead partner on the TVWLP. The Trust is the largest local conservation charity working across Warwickshire, Coventry and Solihull. Their main purpose is to promote the interests of wildlife, wild places and the natural environment for the wider benefit of society, people and local communities. They promote a better natural environment for local wildlife and local people as part of the aim to create a Living Landscape in the West Midlands where wildlife and local people can live and thrive together. WWT manages 65 nature reserves, covering over 800 hectares and is a voluntary membership organisation supported by more than 23,000 individual members, over 20 corporate members and over 700 volunteers. For more information, visit www.warwickshirewildlifetrust.org.uk. The National Heritage Lottery Fund (NHLF). Using money raised through the National Lottery, the National Heritage Lottery Fund aims to make a lasting difference for heritage, people and communities across the UK and help build a resilient heritage economy. From museums, parks and historic places to archaeology, natural environment and cultural traditions, they invest in every part of our diverse heritage. NHLF has supported over 36,000 projects with more than £6bn across the UK. For more information, visit www.hlf.org.uk. This entry was posted in Blog, Events, Featured, Latest News, Meetings, News, Project updates on 27th July 2018 by Tim.